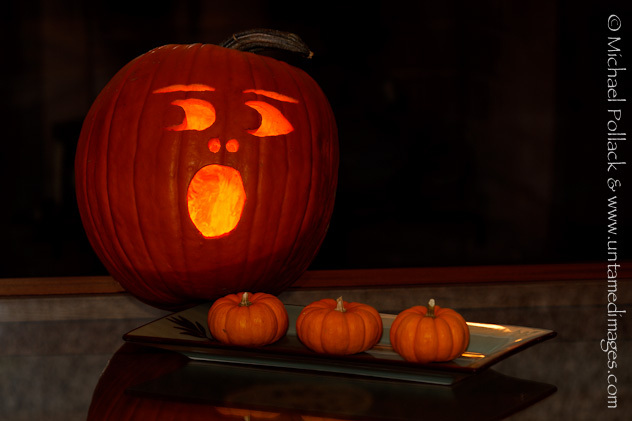 Halloween night is almost over, but it’s not too late to show off this year’s pumpkin. Alison and I were proud of our squash carving labors, but our Jack-O-Lantern managed to attract fewer than 20 trick-or-treaters to our door. Maybe Cupertino has a small population of candy-crazed youths. Oh well, more bite-sized Snickers for us! The aspens in California's Eastern Sierra were late to put on their autumn colors in 2011, but when they finally did, the vistas were stunningly beautiful. Alison and I slipped away on a short road trip after reading reports of some impressive displays of fall color in the the Eastern Sierra. We weren’t disappointed. This shot was taken in the early evening on October 23rd and was one of the first photographs I took on this trip. 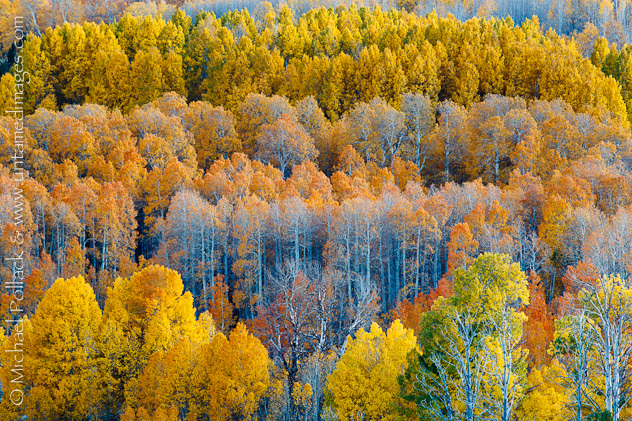 As you can see, this aspen grove at Conway Summit (near the town of Lee Vining) radiated the full spectrum of leaf colors from green to yellow to orange to red. Just a few trees had lost their leaves at this point, which along with the few green trees, indicates that the display was precisely at (or perhaps a tiny bit past) its peak. I’m actually grateful for the few bare trees in the photograph. I think they add an interest to the image and strengthen its composition. Why not leave a comment on the blog or email me and tell me what you think? A Greater Roadrunner (Geococcyx californianus) raises its crest in a regal pose. Around mid-morning on my second full day at the Laguna Seca Ranch in Linn, Texas, this Greater Roadrunner approached the water feature with its partner for a drink. 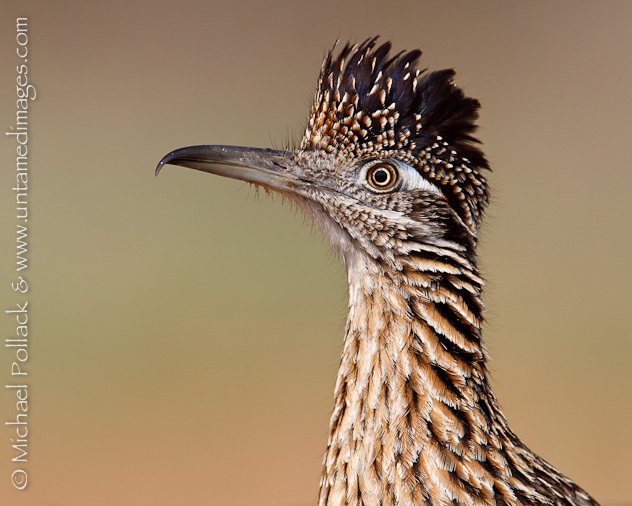 After drinking its fill, the roadrunner stood at attention within point-blank range. I quickly added a 1.4X teleconverter to my 500mm lens and concentrated on getting a nice head shot of the bird. The roadrunner cooperated by showing off its profile while intermittently shifting slightly to angle its bill towards the camera. Only a few seconds had passed before it raised its crest as well, allowing me to take this handsome portrait. I captured this image from the Bulldog Pond blind. Like several of the blinds at LSR, this blind is recessed several feet below ground allowing the photographer to position his or her camera comfortably at ground level. I went to South Texas for the birds, but this Leopard Frog was a nice surprise. I took this photograph in early April at the Laguna Seca Ranch in the Rio Grande Valley of South Texas. 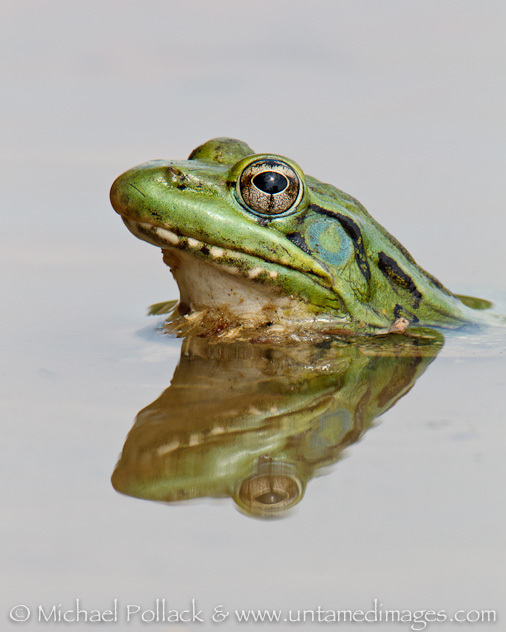 While the primary objective of my trip was to photograph some of the birds that are found nowhere else in North America except in South Texas, when the bird activity waned, the Leopard Frogs and several species of snakes made good stand-ins. Using a 500mm lens with a 2X teleconverter to photograph a subject at the minimum focus distance of 15 feet results in a vanishingly small depth of field. For this shot I stopped down two f-stops from the maximum aperture to increase the DOF to a still-tiny 0.2 inches. Two great horned owlets find new perches as they roam further from their nest tree. Over a span of nearly three weeks this spring, I regularly visited the Madrone Picnic Area in Stevens Creek County Park in Cupertino, CA to observe and photograph a family of Great Horned Owls. I felt incredibly privileged to spend time in the presence of these engrossing creatures. Even when conditions were poor for photography, the family of owls was fascinating to watch. On most visits, I was the only person there with the owls, and for the most part they went about their business while completely ignoring me. Sometimes I would be joined by birders or other photographers, and on several occasions I had the pleasure of pointing out the owls to picnickers or hikers passing by. As the weeks passed I was able to witness the three owlets wolfing down meals supplied by their parents, engaging in spirited tussles, testing their wings and taking short flights with awkward and sometimes violent landings. The adults and young owls also kept my attention with their wide range of vocalizations, including screechy begging calls by the owlets, the characteristic hoot-a-hoot, hoo-hoo call of the adults, and a strange guttural barking sound that one of the adults made repeatedly each evening shortly before leaving to hunt. I have posted a collection of my favorite images of this owl family on my main website. To navigate to the gallery click on the following link: Recent Images. In addition, I have posted several High-Definition video clips of these owls on my YouTube channel which you can find by clicking this link: Untamed Images YouTube Channel. 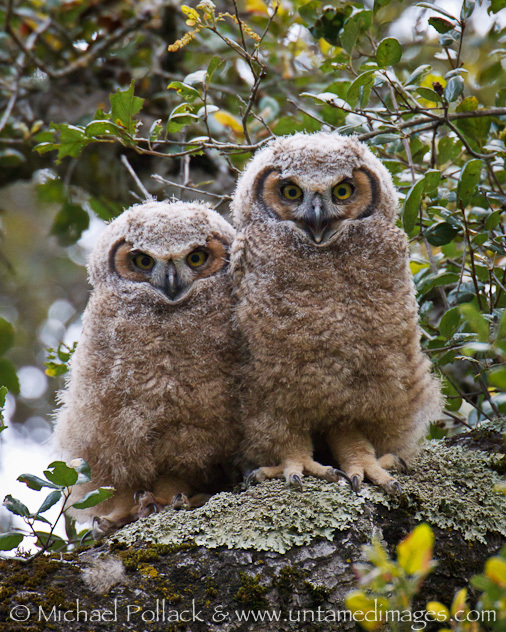 Two great horned owlets stand shoulder to shoulder within an oak grove in Stevens Creek County Park. I captured this image on April 14th, 2011 on my second visit to visit a family of great horned owls in Stevens Creek Park. Upon arrival at the Madrone picnic area, I quickly located all three owlets and one of their parents. None of the owls was in a very favorable position for a photograph, being situated very high with multiple obstructing branches. A bit of patience paid off, however, as I was surprised to find out that the owlets moved from branch to branch frequently, rather than just snoozing the day away as I had been expecting. Even though the owlets had not been out of the nest much more than a week, they were surprisingly mobile as they climbed around their treetop perches using their massive talons to grip the oak branches, assisted by the occasional wing flap. Finally, two of the owlets settled very close to one another on an branch that afforded me a clear view. By now it was nearly seven in the evening, and in the densely forested oak grove the light was becoming quite dim, though because the sun had dipped below a hillside to the west, harsh shadows produced by direct sunlight were no longer an issue. With my Canon 1D Mark IV, I can confidently shoot at high ISO values (ISO 3200 in this case). The low noise signature of this camera combined with the powerful noise reduction algorithms in Adobe Lightroom 3 RAW file converter allow me to make gorgeous prints without sacrificing detail. Two young great horned owls, having recently left the nest in Stevens Creek County Park in Cupertino, California, stare with rapt attention at their off-screen sibling. I shot this video April 14th, 2011, on my very first visit to see this family of great horned owls. As early as March 17th, I had read a post on the South Bay Birds mailing list describing the owls and their location. The initial posting said that the owls were still in the nest, but several weeks later a follow-up post announced that the owlets had left the nest. Figuring that if I wanted to see (and possibly photograph) these owls, I had better not waste time lest they disperse. Little did I know that these owls would remain in roughly the same area for nearly a month, all the while providing incredible viewing opportunities and some (occasionally) great photo opportunities. The owls were located in an oak grove adjacent to Stevens Creek Park’s Madrone picnic area and proved rather easy to find. While the lighting conditions left much to be desired, with harsh sunlight coming from behind the owls, it was a pleasure to watch the owls high in the treetops. Since the light wasn’t cooperating for still photography and each of the owls was at least partially obscured by branches and/or leaves, I instead decided to shoot some HD video of the owls’ behavior. This video clip shows two owlets staring intently at their third sibling, who is out of view, but whom you can hear calling if you listen closely. The owlets also demonstrate head-bobbing, a behavior performed by great horned and other owls to better estimate the distance to an object or animal. NOTE: Since this post contains the first video clip on this blog, I thought it would be worth mentioning that it is possible to view this video in high definition. (Unless you have a slow internet connection, I think it is worth it to view the HD version.) One way to watch the clip in HD is to click on the Full Screen button in the lower right-hand corner of the YouTube player window, then click on the Play button on the lower left to start playing the clip. As soon as the video begins playing, a button will appear at the bottom of the screen labeled 480p. Click this button and select 720p or 1080p to switch to the HD version of your choice. Depending on your download speed, you might need to give the video a bit of a head start before playing it all the way through to the end. 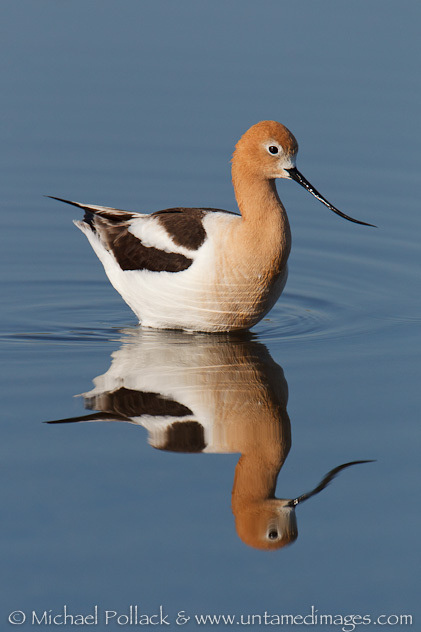 An American Avocet (Recurvirostra americana) pauses momentarily while feeding in a former salt pond in Alviso, California. Thanks to a message posted the Bay Area Bird Photographers (BABP) mailing list by Peter LaTourrette, I recently decided to check out the shorebird action in Alviso. (If you would like to join BABP, click here for membership information.) Peter’s message told of “breeding-plumaged Dunlin, Western and Least Sandpipers … swirling about and feeding in good light” in a former salt pond. I checked out the pond near Alviso Marina County Park over the weekend and, as I had hoped, there were good numbers of the promised shorebirds. The birds tended to be rather cautious, but I was able get a number of quality wading and flight shots to add to my portfolio. Unfortunately, upon returning to the salt pond yesterday at dawn, the numbers of Dunlin and Sandpipers had dropped significantly, and their caution had been transformed into fearful avoidance of my general vicinity. The only consolation for spending my morning sitting in the mud on the edge of the pond was the very cooperative American Avocet pictured above. As the avocet fed, it moved along the pond’s edge, passing right in front of me without a moment’s hesitation. 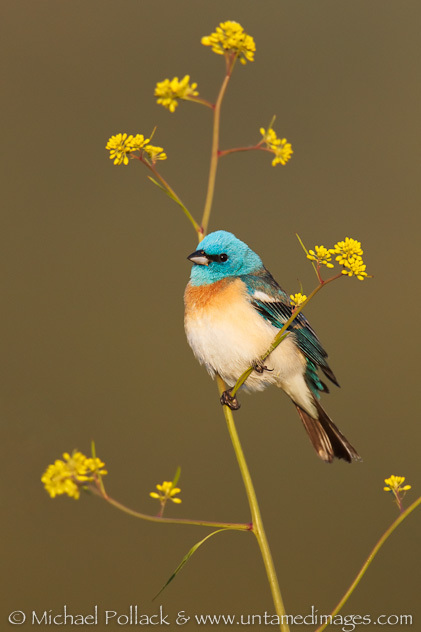 A male Lazuli Bunting (Passerina amoena) perching among mustard flowers. Over the past two weeks while hiking in Rancho San Antonio County Park I have been greeted by the spring song of the lazuli bunting. As they have done for many years, in mid- to late-April, male lazuli buntings appear near the water tank on the north side of the Coyote trail. This year has been no exception. I first photographed lazuli buntings in precisely the same location in April of 2003. 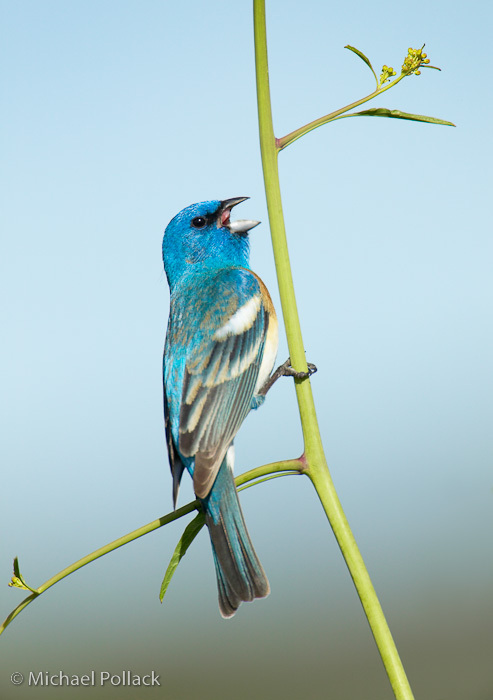 On April 23rd, 2004, I photographed the singing male lazuli bunting shown in this photograph, again in the same spot. Last year, on April 24th, I captured the image featured in this post in beautiful light just as the sun began to rise. The same location has been reliable for house and Bewick’s wrens, song sparrows, violet-green swallows, western bluebirds, and occasionally ash-throated flycatchers. But for me, it’s the lazuli buntings that always steal the show. First, let me welcome you to my new blog. If you are reading this post you are joining me at the very beginning. 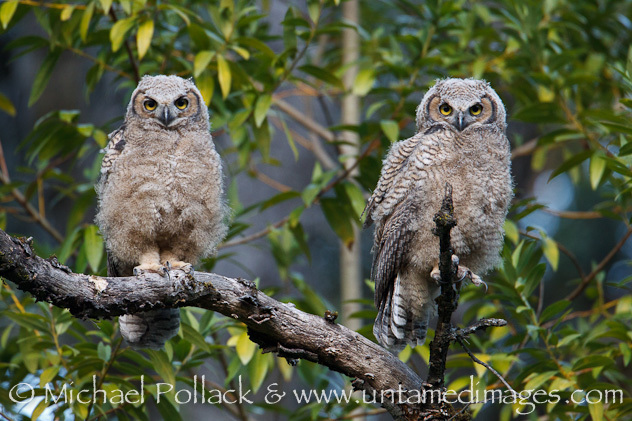 My name is Michael Pollack and my nature photography business is called Untamed Images. You can read more about me here http://untamedimages.com/about. The main purpose of this blog will be to serve as a vehicle for sharing my photographs. In the past, I have shared groups of images in galleries on my website at http://untamedimages.com/galleries. In these galleries, I often present batches of photographs from a trip to a photographic destination, but I also have themed galleries such as “Birds” and “Landscapes”. I periodically add to these themed galleries, but before starting this blog I lacked a convenient way of informing my followers of new work added to existing galleries. I will still add new galleries periodically, but with this blog I will be able to highlight individual images that I feel are worth sharing. I also intend to use this blog occasionally to share my thoughts regarding tools of the trade for photographers. Whether it’s a new piece of camera gear, or an photo-specific software application, I will be writing unbiased evaluations of the equipment that I employ in the field and in the digital darkroom. As readers of this blog you have the ability to comment on my posts. I hope you take advantage of that functionality and regularly share your thoughts with me. Southern Kenya Photo Gallery Now Live! All images and text copyright Michael Pollack. All rights reserved.